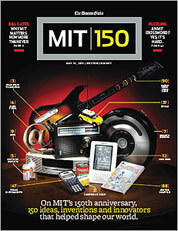 When MIT was founded 150 years ago, it adopted a novel approach for the world of higher learning. It combined theoretical knowledge with hands-on learning and emphasized research and teaching equally. It was exactly what the United States needed to help ignite the countrys Industrial Revolution. Today, MIT remains unrivaled when it comes to the basic and applied research needed to address the complex challenges of this century. It is on the forefront of advancements in areas such as energy, climate change, disease, and poverty alleviation. At 150 years old, it shows no signs of slowing down. I was lucky enough to take a few courses at MIT when I was studying next door at Harvard. And over the past three decades, Ive visited MIT many times and have always been impressed with the caliber of its students, professors, and academic leaders. Its remarkable to think that 76 current and former MIT members are Nobel Prize recipients. Many other MIT faculty and graduates have distinguished themselves in their fields. In the late 19th century, Ellen Swallow Richards, the first woman to graduate from MIT, pioneered water-quality testing in the United States. A.D. Little, a member of the class of 1885, discovered important uses for cellulose acetate and went on to establish the countrys first management consulting firm. Pierre S. du Pont, who earned a chemistry degree at MIT in 1890, played a key role in the growth of his familys chemical company and the US automotive industry. In the 1930s, MIT professor and administrator Vannevar Bush advanced the visionary concept of a database-like device called the memex in which an individual stores all his books, records, and communications. During World War II, MIT scientists developed radar, a critical contribution to the Allied war effort that enabled the modern era of flight. More recently, MIT researchers have been at the forefront of breakthroughs in molecular biology, biomedicine, and the study of cancer and genetic diseases. Breakthroughs in these areas could revolutionize health care and profoundly improve the lives of the worlds poorest. MITs OpenCourseWare Internet site makes videos, lecture notes, and sometimes even exams from 2,000 undergraduate and graduate courses available to the world, free of charge. These include the world-renowned physics courses taught by professor Walter Lewin, which have been viewed more than 5 million times and which Ive watched repeatedly. OpenCourseWare has become a national model for delivering online education and democratizing learning. MIT has also been a leader in partnering with industry on research, and it encourages an entrepreneurial spirit, while asking faculty and students to consider the social relevance of their research and learning. A recent study showed that MIT alumni have founded nearly 26,000 companies, which collectively employ 3.3 million people and generate about $2 trillion in annual sales. At a time when high schools and many colleges and universities are struggling to attract women and minorities to science and technology, almost half (48 percent) of MITs undergraduates are minorities and 45 percent are women. This country has many extraordinary universities. But few excel as MIT does in combining rigorous academic inquiry, breakthrough research, an entrepreneurial spirit, and a social conscience  qualities that will ensure its stature and relevance far into the future. 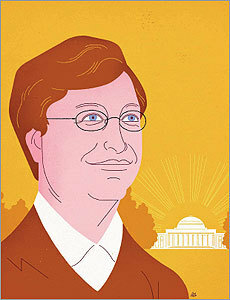 Bill Gates is cochair of the Bill & Melinda Gates Foundation and serves as chairman of Microsoft.